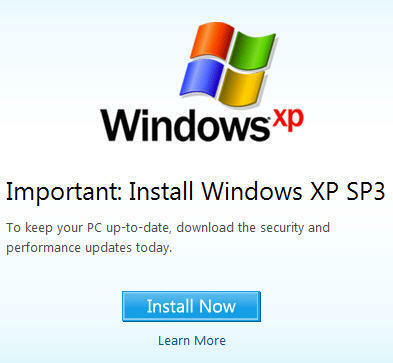 Today Microsoft has ended support for the long time king of Windows operating systems, Windows XP SP2. It’s a simple thing, says Microsoft, just upgrade to Windows 7. Today marks the end of security updates for Windows XP SP2 as Microsoft pushes users to Windows 7 without so much as a mention of the plague known as Windows Vista. Users still have the option of installing XP Service Pack 3 and continuing to receive updates until April of 2014 but don’t forget the problems that accompanied that release. If you’re straining to recall, let me shake up your memory with this and this, and my all time favorite, Trainwreck. Microsoft is reporting that 74% of business machines are using XP so you can bet there is some sighing going on in the conference rooms across America as C?O’s contemplate their choices. So what will it be; a risk of known issues or spending some pretty hefty bucks when bucks are scarce? After 10 years of support you can’t say Microsoft has cut us short, but because Windows 2000 users are also seeing the end of support, there will undoubtedly be some budgeting concerns for many of todays already strapped small businesses. You have to wonder whether this will cause any movement to Windows 7 or even increase the slow trickle of users to the free and widely available Linux options. Here’s one view of today’s OS standings. I have to believe that Business concerns will back up like they’ve never backed up before and try the cheap but risky jump to Windows XP SP3. We should know the outcome soon. The Pit Blog long time, Microsoft, operating, Support, time, Today, Windows, windows operating systems, Windows XP. permalink. What a con! Gates has the world convinced it needs his wares. Upgrades are fine but mandatory new OS is, well, a con. And, hospitals are in this mess just as the rest of the business world. Big expense for no real benefit. I am reminded how much I like Firefox. Time for serious study of Linux folks! Mentioning windows 7 is mentioning vista. They are essentially one and the same. Much the same way windows 2000 and windows XP were one and the same. And what about XP service pack 3? I can’t afford windows 7.already noticed XP Home has been blocked from updates for awhile now. And besides my XP Media Edition does most of what windows 7 does already. Been There, Done That.